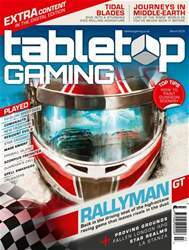 A FREE GAME FOR YOU TO PLAY INSID EVERY ISSUE OF TABLE TOP GAMING! Words have power, little ones. The power to make gods of mice and ruin of kings. You have, all around you, this power. It lives in your magazines and newspapers, your penny dreadful romances and BOGOF fantasy books. I ask of you: harness this power and take part in the Word Wars! Word Wars, for all the ancient soothsaying, is a simple game. First, assemble a group of three or more friends. Secondly, get a stack of wordy things you can stand to destroy. (Use this page if you like!) Thirdly, get a pair of scissors each, for the ancients were obsessed with arts and crafts.